Separately, republican militants in the area have been linked to two shooting incidents amid suggestions that they may be engaged in a ‘house cleaning’ crackdown. 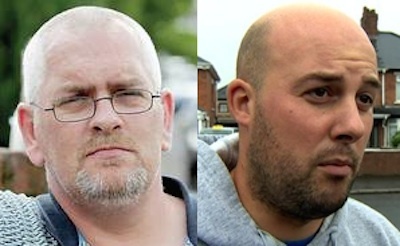 Both the Republican Network for Unity and GARC, the Greater Ardoyne Residents Collective, said on Friday night that Meehan (pictured, left) had been expelled for attempting to encourage loyalists to smear Dee Fennell (pictured, right), the GARC chairperson and an equally prominent Ardoyne activist. Meehan has not yet responded to the accusations. He told journalists last night he had no comment. GARC campaigns on behalf of Ardoyne residents in regard to sectarian parades and other matters, and operates in parallel with the Sinn Fein-supported residents group, CARA. In a hard-hitting statement, the organisation claimed last night it had evidence that Meehan had sent private messages to a well-connected loyalist in regard to a potentially controversial comments about armed actions made by Mr Fennell. GARC said Meehan had been offered an opportunity to refute the claims last weekend by opening access to the messages on his computer account, but he had refused. “The activities of Martin Og Meehan were intended to undermine the integrity of our chairperson, committee, residents and the valuable work we do. They were an attempt to cause division from within,” they claimed. “Along with those he collaborated with, he has failed. In a terse statement, the Republican Network for Unity also said Meehan had been dismissed with immediate effect “for a serious breach of the Code of Conduct”. Both GARC and the RNU have said they will make no further statements on the matter. Separately, there were shooting incidents in both the Oldpark and New Lodge areas of north Belfast. Although there appeared to be a degree of coordination in the attacks, the police declined to say the shootings were connected. One man, named locally as Harry McMahon, was said to be seriously injured after receiving a head injury just before 6pm near a fast food outlet in Oldpark. The PSNI said McMahon, originally from the Unity area of north Belfast, had been warned he was under threat from a republican armed group, and had been advised to review his personal security. Meanwhile, a second man was shot in both legs in an apparent punishment shooting attack in the New Lodge area of north Belfast at about 8pm. No organisation has yet claimed responsibility for either incident. Local Sinn Fein Assembly member Gerry Kelly said: “These attacks are wrong and must be condemned.